4.5 stars. Brutal, unforgiving and raw. The Water Knife plunges you into action and doesn’t let up until the very last sentence. This novel is a speculative science fiction story about climate-change induced drought in America that hits far too close to home. This is also definitely not a novel for the faint-hearted, as it includes descriptions of torture, sexually explicit content and swearing, though these are used to illustrate points rather than being the focus. Set on the West coast of the US in the near-future The Water Knife plays on existing social issues of class division, fears of migrants and refugees, militarisation of borders and drills down into the ramifications of the individualistic nature of American society. The story follows three main characters: Angel, a Mexican jack-of-all-trades and sometimes hitman for the most powerful woman in Nevada, Lucy, a journalist who has become too attached to the imploding city she reports on, and Maria, a young refugee from Texas trying to survive with only her wits as currency. This perfectly illustrates the dramatic urgency that permeates this book. The narrative is claustrophobic at times, and left me feeling physically drained if I read it for too long in a single sitting. This intensity can be a little overwhelming, but I think it was necessary to give the book such a powerful feeling of immediacy, as though this is not a work of fiction but rather a path we are already treading. This book was the July read for my book club, and in our discussion post one of my fellow readers observed that this book “is like watching a train wreck in slow motion and we cannot look away”. I have been reflecting on that over the last couple of days, and relating it to my own experience of the discourse around Climate Change. And it has prompted me to ask myself; At what point are we going to collectively stand up for the things that we can see, the ways we know we are destroying or poisoning our world? Will we ever? And what responsibility do we have as individuals? I don’t know the answer to these questions, but I think there is something to be said for the notion that Paolo expresses in The Water Knife that Americans have ‘forgotten what it’s like to have neighbours’ and I think that here in Australia we are much the same. We have lost sight of the value to be had in collective good rather than selfish attainment, and our world suffers for it. 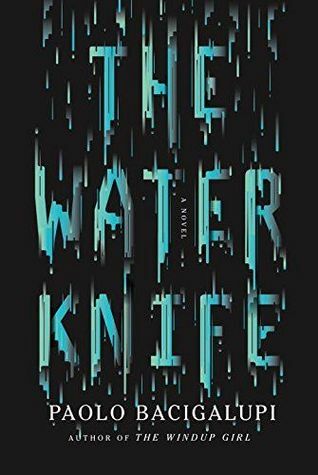 The Water Knife feels so vivid, real, and immediate that it is hard to read it and not overlay it with my own experiences and views. It’s not an easy read, but nothing dealing with the most dire and desperate instincts for survival can be. Despite the heavy subject matter I really enjoyed this novel. I especially liked the character development of Angel, Lucy and Maria, which was handled skilfully, acknowledging some of the more obvious tropes in the apocalypse genre without relying too heavily upon them. This is not going to be the kind of novel that appeals to everyone, or even to a large range of people. But if you are a fan of novels about the end of the world this is one of the more fast-paced and intriguing examples. It doesn’t focus too much on the detail of how and why the disaster is occurring, but rather on the human impacts and reactions. The exploration of human response to slow burning disaster is what appeals to me most, and is the reason I would recommend it. Suitable for ages 18 and up, for graphic violence, torture, sexually explicit content and swearing. This sounds like a good read. I will keep it on my Radar. After reading Ruby I think I need a lighter book.